Even though everybody told us that the backpacker route to Machu Picchu via St. Teresa is very easy we couldn’t get a clear idea what to expect. Therefore we decided to document the trail in pictures and post it here for anybody who plans to hike to the famous ruins. The town Aquas Calientes is the closest access point to the historical site of Machu Picchu. From here one takes a bus or hikes a steep 6km climb up to the ruins. There are no roads leading to Aquas Calientes therefore it can only be reached by train or by foot. Train tickets range from $48 to $200 / one way via Ollantaytambo or $18 / one way via St Teresa. St. Teresa is also the preferred destination for any budget traveler who refuses to pay the high priced train ticket and prefers to hike instead. To get to St. Teresa you have to take a bus to St. Maria (from Cusco 4 hrs,, 15 to 20 Soles) and take a collectivo (taxi) from the bus station in St. Maria to the Hidroelectrica train station outside of St. Teresa (1.5-2 hrs, 15 Soles). The dirt road ride along a steep canyon can be very “exciting” depending on the driver. The train station gets it’s name from the gigantic hydro-electric power plant construction side which occupies large parts of the canyon. The collectivo stops just before the Hidroelectrica train station at a control booth at which any backpacker has to sign in. From there you can walk 3 minutes to the train station and start the hike along the tracks or get on a trail head which leads to the tracks after 10 minutes. 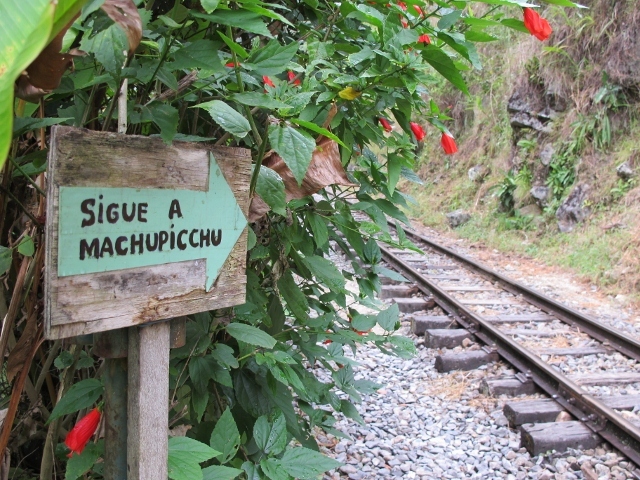 If walking through the train station look out for the 3rd Escape sign with a “Camino Machu Picchu” sign next to it. Follow the sign up the hill through the forest where you find the train tracks back after a few minutes. Turn left and follow the tracks. The 2.5 hour track to Aquas Calientes is very easy. After about 30 minutes you reach a steel bridge over the river. Look up to the right and scan the mountain tops to get a first view of the Machu Picchu ruins. From here on parts of the ruins and the Watchman’s House in particular can be seen quite often throughout the hike. The train tracks lead straight into Aquas Calientes. To avoid the 2 tunnels just before Aquas Calientes leave the train tracks at Puente Ruinas station and cross over to the dirt road which leads up the river into town. When walking back to St. Teresa make sure to walk through the train station. This is where you find collectivos waiting. They will only leave when full. So team up with other hikers or coordinate with the arrival time of the train; 4 people will fill a taxi which will then leave immediately. Otherwise you might wait for a couple of hours. Hiking from the station to St. Teresa will take another 1.5 – 2 hours.